Sometimes it might seem like Amazon.com, Amazon.in, etc., are insurmountable online stores. But take a look at that Google Play store inside almost every Android phone out there. What stops Google from converting it into a general-purpose online store selling everything from shirts to jewellery to perfumes to industrial products? In my opinion, nothing, actually. The Play store already has massive "footfall" in the form of billions of Android users browsing, searching, surfing, and using the store. Google also has deep knowledge about what its/these users like and want, based on their Google searches, Gmail emails, Chrome URLs, YouTube video viewing, Google Play applications installed, and so on. Using this trove of data, Google can target specific products at individual users [just like currently it targets ads for products/services]. 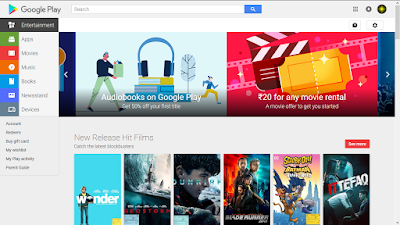 The Play store doesn't have to be - and eventually/probably won't be - restricted to only movies, TV shows, magazines, books, games, applications and other types of digital content pieces. I think Amazon knows that it's vulnerable in this way.